Doesn’t everyone think that his church is a Bible-based church? Is there anyone out there who goes to a church she thinks is NOT based on the Bible? One of the phenomena I finally noticed this year is the fact that we have three kinds of churches we consider to be Bible-based churches. I can’t believe I never realized this before this year, but I suspect the level at which we discern where our leaders are taking us is far lower than our comfort zone. We just don’t want to admit it. Many of the battles we see within Christendom, particularly in America, are rooted in a fundamental problem with how we view the authority of Scripture and its complete, unified message. Well, take a sampling of churches you’ve been a part of in your walk with Christ. They’re all Christian churches and as such would be considered an outgrowth of the New Testament as it adjoined and grew out of the Old Testament. But what too often happens in our churches is that we fall into a divisive view of Scripture that pits the New Testament against the Old and vice versa. From this internal battle, we generate a litany of disagreements about how to properly walk out the Christian life. I would have fainted unless I had believed to see the goodness of Jehovah in the land of the living. He who dwells in the shelter of the Most High will abide in the shadow of the Almighty. I will say to the LORD, “My refuge and my fortress, my God, in whom I trust.” For he will deliver you from the snare of the fowler and from the deadly pestilence. He will cover you with his pinions, and under his wings you will find refuge; his faithfulness is a shield and buckler. You will not fear the terror of the night, nor the arrow that flies by day, nor the pestilence that stalks in darkness, nor the destruction that wastes at noonday. A thousand may fall at your side, ten thousand at your right hand, but it will not come near you. You will only look with your eyes and see the recompense of the wicked. Because you have made the LORD your dwelling place— the Most High, who is my refuge— no evil shall be allowed to befall you, no plague come near your tent. Bless the LORD, O my soul, and forget not all his benefits, who forgives all your iniquity, who heals all your diseases, who redeems your life from the pit, who crowns you with steadfast love and mercy, who satisfies you with good so that your youth is renewed like the eagle’s. Praise the LORD! Blessed is the man who fears the LORD, who greatly delights in his commandments! His offspring will be mighty in the land; the generation of the upright will be blessed. Wealth and riches are in his house, and his righteousness endures forever. For I know the plans I have for you, declares the LORD, plans for wholeness and not for evil, to give you a future and a hope. Then Peter said in reply, “See, we have left everything and followed you. What then will we have?” Jesus said to them, “Truly, I say to you, in the new world, when the Son of Man will sit on his glorious throne, you who have followed me will also sit on twelve thrones, judging the twelve tribes of Israel. And everyone who has left houses or brothers or sisters or father or mother or children or lands, for my name’s sake, will receive a hundredfold and will inherit eternal life. To the present hour we hunger and thirst, we are poorly dressed and buffeted and homeless, and we labor, working with our own hands. When reviled, we bless; when persecuted, we endure; when slandered, we entreat. We have become, and are still, like the scum of the world, the refuse of all things. An attitude exists that somehow relegates the OT to the past, as if the NT is the only real Scripture for the Church (even if the apostles and NT writers were only quoting from the OT). It’s like the OT ceased to exist once the canon of the NT was completed. Let me tell you: the people in the seats are confused. The hot new word in Christian circles is worldview. We love the idea of a coherent Christian worldview, don’t we. I know I do. But if that’s true, then why are we stuck in one testament or the other? Wouldn’t a comprehensive Christian worldview fully integrate the Old Testament life of the faithful with the New Testament life of the faithful? Unfortunately, you see battling testaments everywhere. One that burst on the scene recently was the environmental care flap after a few Evangelicals asked us to ponder global warming. The NT supporters instantly let us know that the Revelation tells us it’s all going to burn, while Matthew’s inclusion of Jesus’ Great Commission makes it the only thing we as a Church should be doing. The OT supporters, on the other hand, went back to Genesis and reminded people that the original call to stewardship of Creation that God gave Man in the Garden has not been rescinded. And the mouths started yappin’. Are we afraid of the Whole Bible? Are not the Scriptures the unified words of God to Man? If so, then why do we pit the OT and NT against each other? Where is our scholarship that makes it possible for us to be blessed by God with health, wealth, and might , while also understanding that in this world we will have trouble, sickness, and poverty, even in the Church? I’d love to see an American Church that is routinely operating out of both the New Testament and the Old, not afraid to link both. Instead we get the NT aficionados battling the OT aficionados. Every so often we do get that third way, the Whole Bible Church, but in my travels it seems to be a rarity. Still, it’s a rarity we need to ensure is less rare every day. What will it take to make us a “Whole Bible” Church? Typo here: “church sometimes act as is 2 Timothy 3:16-17 isn’t true:”. once again, dan, you are right on. Now tell me if the subjunctive tense on that “isn’t” is correct or not! I do not support the environmental activism some evangelical churches have taken up. If they are that concerned about the environment, then let volunteers convert empty churchyards into parklike gardens (or vegetable gardens to share among the congregation and poor). “Are not two sparrows sold for a farthing? and one of them shall not fall on the ground without your Father” (Matthew 10:29). “For the earnest expectation of the creature waiteth for the manifestation of the sons of God […] For we know that the whole creation groaneth and travaileth in pain together until now” (Romans 8:19, 22). “And the nations were angry, and thy wrath is come, and the time of the dead, that they should be judged, and that thou shouldest give reward unto thy servants the prophets, and to the saints, and them that fear thy name, small and great; and shouldest destroy them which destroy the earth” (Revelation 11:18, emphasis added). I think the confusion would end, though, if we could integrate the Old and New Testaments into the understanding of Jesus Christ and our wholeness in Him. If we looked for Jesus in the Old Testament, really looked to find Him, rather than just look at it as a bunch of rules and experiences we might learn lessons to avoid, then maybe we would have a paradigm shift in our worldview. Your blog is really cool. I’m new to the whole blog thing, but I’ve seemed to stumble upon some good ones. It is sad Isnt it, that churches fall away from doctrine. I don’t really know what a pentacostal church is, and I have a weak understanding on that a charismatic church is(im going to ask my discipler about these terms, im sure he’s told me, i just forget), but I think I got your point. Im blessed to go to a bible believeing non-demoniational church, so I’ve been taught some good stuff. I dont really see how scripture can contradict itself, or how the old testament can go against the new. It can’t contradict itself, the bible is Gods word. How can a church say its really bible based if it only uses one of the testaments, like you mentioned. that dosent make sense, do they really believe that one testament is right and one is wrong? If one part of the bible isnt true, then why would anyone put their faith on another part? that would be silly. 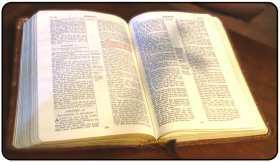 The bible is innerrant, infallible, authoritative and eternal. shoot i seemed to have lost were i was going, sorry. That’s an interesting insight, Dan. I think I’ve always been taught that the NT sort of trumps the OT when the two don’t seem to be in agreement. I’m not saying that is a good way to look at it but that’s been my understanding. Clearly us Christians aren’t under the Levitical laws…I guess I get confused as to what things fall under the old covenant and what fall under the new. I don’t want to overemphasize either testament over the other. I want to find the bottom line. But I’ll admit that sometimes it’s a bit confusing. Stop making me think, it’s too early. Michael Rew’s comment was, in my humble opinion, right on target. It should not be an issue of which testament “trumps” the other. Jesus told the religious leaders of His day that they searched the Scriptures, thinking that in them (the Scriptures) was life. But, He said, they point to Him (Jesus) and He told us that He is the life. Being a “whole Bible” church should mean that Jesus is being preached, taught, and lived out. The Bible is not a puzzle to figure out. It’s not a book to be studied for academic knowledge only. And only insofar as we find Jesus in the Bible will the Bible even give us life. Your insight into the OT teaching/preaching churches and the NT ones are right on. I had never thought of that before. So, in a sense, money makes these churches “Whole Bible” churches. Thanks for commenting and for the kind words about Cerulean Sanctum. This blog talks a lot about Church issues in America. I never want it to be confusing, but because some of the topics are best understood after being in the “church world” for a long time, for people who are new in Christ it’s probably a headscratcher. Pentecostals are those churches that came out of the Azusa Street revival early in the last century. They are churches that believe that the gifts of the Holy Spirit in 1 Corinthians 12 are still for modern times. Churches that fall into that category are Assemblies of God, Foursquare, Pentecostal Holiness churches, and so on. Those churches would be considered charismatic because they believe the gifts still operate, but the term charismatic is sometimes used to distinguish those churches from the movement that started in Lutheran, Episcopal, and other mainline churches in the 1960’s. That move of the Lord brought a whole new set of people who had no connection to the Azusa revival into the movement. Those folks who left those churches were part of the Jesus People revival of the early 1970s from which the Third Wave charismatic churches like The Vineyard and Calvary Chapel arose. Another great post, Dan. If you’re ever in Boise, drop by the Vineyard where the pastor regularly teaches through one NT book and then one OT book and then one NT, etc. We paused in that normal schedule to do the Bible in 90 Days challenge. After spending 9 months doing a systematic theology study, I came to the place of knowing I’m unable and possibly not supposed to understand everything about God’s word or His ways. i.e. I know He is completely in control and yet I know He gives me free will. I haven’t figured out how that works. I just know the word tells me it is so, and so by faith I accept it. I’ll add one thing: The more I read your blog, the more grateful I am for the church home God gave me. I think your subjunctive should be “weren’t.” E.g., “were it not true”. I could be wrong, though; it’s not like I use the subjunctive a lot. At any rate, I think this whole post is a good call. Too many churches perceive the NT as battling against the OT, and it doesn’t – not really. As you said, it’s an outgrowth. As far as the environmentalism goes – the Earth is a gift from God, just as much as His Son’s death and resurrection are, and we should respect it. Thanks for another thought-provoking post. The problem of OT versus NT seems to me to be part of a larger issue— how to interpret the Bible properly. Yet there are OT practices that today we no longer need to do, because Christ’s “fulfilling” work makes those things no longer necessary (such as the practice of animal sacrifices for sin). I sometimes wonder about Pentecostal/Charismatic quoting of certain OT passages as promises for today— I wonder whether some of those promises, often given to Israel— can be seen as being applicable to us today. But on the other hand, Charismatic teachers like Derek Prince have taught that principles set forth in the OT law are still valid today— for example, the curses and blessings that come from obedience and disobedience in Deut 28. Perhaps the determining factor would be to decide if the particular OT truths/promises are superceded by Christ’s work on the cross, or not. On this basis, some OT practices are no longer to be followed, while other truths continue to be relevant. For example, the NT passage Galatians 5 says: whatever one sows, that will he also reap. This seems to echo a principle of the Law as taught throughout the OT. When Paul writes that we Christians have been grafted into the vine that is Israel (Romans 11), I would think you’d have to argue strongly that the promises that God made to Israel in the OT are applicable to Christians today. On the other hand, there’s a sense that the mission of Israel/Church has changed somewhat from a national to an individual focus, so the NT supporters can argue that even if the individual is weak, the Church as a whole is strong. Still, we need people who exegete a complete worldview that accommodates the whole of Scripture into a coherent framework of blessing. Boy, Larry Who hit the nail on the head. I’m blessed to go to a Whole Bible church. If the balance were humanly attainable, it would have been attained by now. It appears that God is still not looking for rules, but relationships. After all, the Holy Trinity Itself is perfectly related — Father, Son, and Holy Spirit.